This is an estimate of the total mass of an element likely to be found in a 70 kg human (an "average" human). 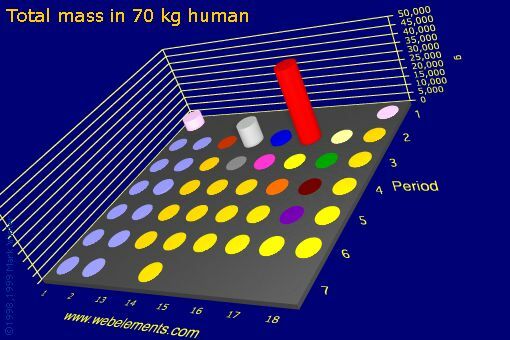 Image showing periodicity of total mass in 70 kg human for the s and p block chemical elements. The units used in WebElements for all abundance data are ppb by weight which means parts per billion by weight, that is mg tonne-3 or mg per 1000 kg. All abundance data are also presented as ppb by atoms, which means atoms of the element per billion atoms. The reason for rescaling all data is as follows. It is common to see, say, solar abundances expressed as the number of atoms of the element relative to a scale upon which the abundance of hydrogen is defined as 1012. This makes comparison with, say, crustal abundances difficult, since crustal abundances are often expressed in terms of parts per million by weight. Hence a common scale is used throughout and I chose ppb as this gives manageable numbers for most elements. W. Kaim and B. Schwederski in Bioinorganic Chemistry: Inorganic Elements in the Chemistry of Life, John Wiley & Sons, Chichester, UK. H.J.M. Bowen in Environmental Chemistry of the elements, Academic Press, London, UK, 1979. P.A. Cox in The Elements : Their Origin, Abundance, and Distribution, Oxford University Press, Oxford, UK, 1989. A.M. James and M.P. Lord in Macillan's chemical and physical data, Macmillan Press Ltd, London, UK, 1992.